It's difficult to get good photos in this room. The room is very dim because there is a huge walnut tree shading the window. And when I bring in artificial light, it makes the paint look too gold, so I tried playing with the exposure on the camera. It worked better than the flash, but I'll just have to wait until fall, when the tree outside loses its leaves and the room gets good natural light again. The color is Hubbard Squash (SW0044) from Sherwin Williams, from their Arts & Crafts Historic color palette. We still have to rehang the doors and will probably do that tomorrow. They need to be stained and shellacked, but that project will wait until after my brother's visit. I really like all the colors you are choosing. All your hard work is paying off! Thank you. I made the decision much easier by just limiting my choices to the Sherwin Williams Arts & Crafts historic color palette. Looking good! Isn't it a great feeling to walk into a freshly painted room? This is why I hate tape! I find it much easier to cut in and wipe up any stray glops of paint as I go. The colour looks great with the wood! I love your color choice! ;) We are sticking to Sherwin Williams as well, so it has helped us with picking paint colors. I have found that cutting in is a lot easier than using painter's tape. With our walls, nothing is flat anyways and paint always drips under the tape. As far as painter's tape, try green or yellow tape by Frogger Tape. Sherwin Williams sells it (the only place I'll buy my paint) and it's more expensive, but oh my, does it do a better job at sealing! 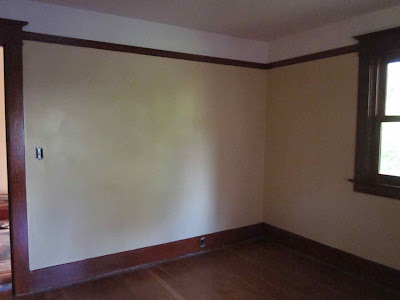 We just completely repainted our den, from ceiling, walls, trim, and even the sub-floor (long story, but Sherwin Williams has great floor paint & it turned out gorgeous in French Roast). 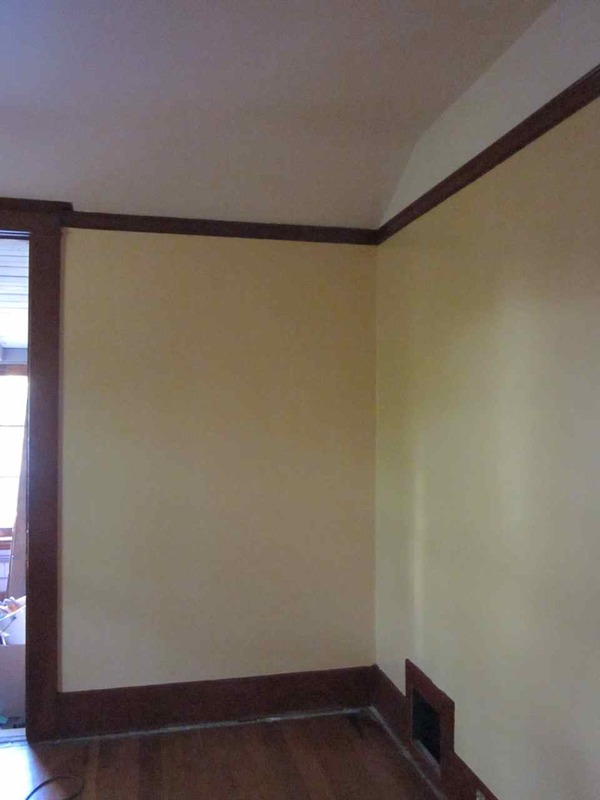 I used the yellow tape, for delicate areas, on my newly painted trim and it was FANTASTIC! I used to always use the blue tape and always had leaks. Well not with the Frogger Tape! It has a patent pending gel that forms when it comes in contact with latex paint, and that gel keeps the paint from leaking. I'm stopping by from Hooked on Houses. I had to commend you for your beautiful work so far. I left a pretty blistering comment at HOH for those people who think the woodwork is too dark, they don't like the colors...blah, blah, blah. Some folks obviously don't get the Craftsman style. Anyway, I probably didn't win myself any fans today, but I applaud your efforts to embrace the beauty of Craftsman architecture. Well done! Thanks Anonymous for the tip on FrogTape. I'll definitely look for that before painting another room. And thanks Heather for your very nice comments. Not everyone gets or appreciates these old stained wood homes, but I find them beautiful and worth the trouble to restore. beautiful! 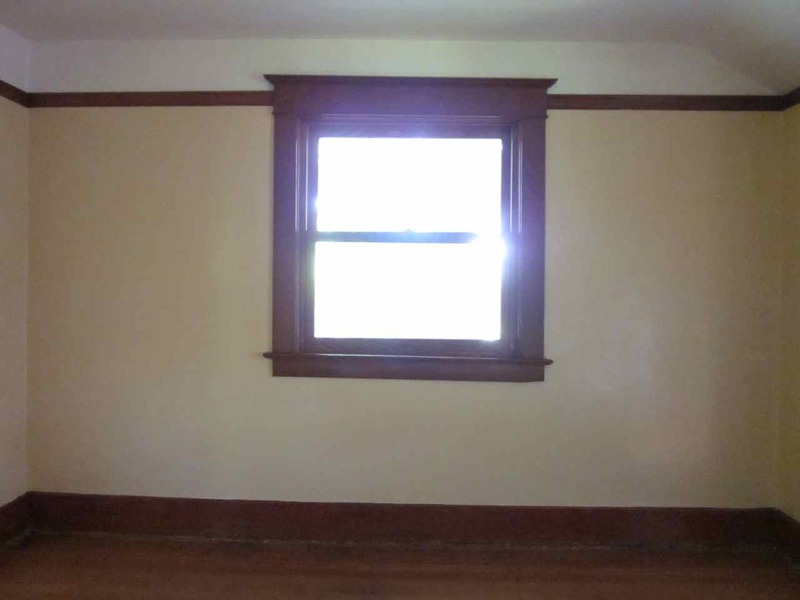 we chose quite a few colors from sherwin williams' arts n crafts palette, including that same hubbard squash for our front dormer in the master bedroom. it's so nice and cheery. the woodwork looks amazing. and i second the green frog tape. it's the best! Wonderful color. The top crown molding is exactly what I want in our rooms (to give the illusion of taller ceilings than what we actually have), as well as the wider baseboard molding. Some homes are fortunate enough to have those already in place. Remodeling a home (this is our third) is a lot of hard work, but it can be rewarding too. I wish we were as near the end as you are. We started several years ago, but due to finances had to put things on hold. We're slowly getting back to it now and hope to finish soon.